One day, as I was flipping through some old pictures of LBJ, I noticed that his wife, Lady Bird, had a discolored front tooth. Rather than be disgusted or repulsed, I was actually kind of impressed. Growing up in a time when image often (always?) trumps depth, it is hard for me to imagine a woman as prominent as Mrs. Johnson refusing to get her tooth capped. Looking back at pictures from my grandparents' day, I see a similar phenomenon: the images are filled with men and women who are blotchy, overweight, have crooked teeth, or otherwise fail to live up to the beauty ideal of my generation. Part of the reason for this, of course, is the fact that styles have changed; similarly, the beauty industry is constantly developing new technologies for pampering and self-glorification. A few years ago, the idea of injecting a biotoxin into one's skin would have seemed outlandishly repulsive, yet Botox is now a multi-million dollar business. On the other hand, earlier generations often didn't have the disposable income necessary to support today's massive beauty industry. 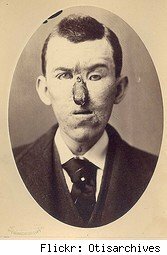 Expensive plastic surgery was reserved for wealthy people and the victims of disfiguring accidents. For anybody else, it would have been an outrageous extravagance. There have been similar declines in the cosmetic dentistry and laser eye surgery businesses, as many potential customers have decided that this isn't the year to get expensive veneers or have their eyes permanently "fixed." It's not hard to imagine this trend spreading into the cosmetic industry, where "youth-defying" creams often run into the hundreds of dollars per ounce. On the bright side, with a little carefully-targeted spending, our upcoming economic stimulus package might be just the thing to help iron the wrinkles out of America's foreheads! Bruce Watson is a freelance writer, blogger, and all-around cheapskate. His "getting old with style" hero is Spencer Tracy.